Barra de plata Chacal Anubis de 1 onza | Serie Reliquias Egipcias Monarch Precious Metals Purchase your 1 oz Egyptian Relic Series Anubis Jackal silver bar from our online shop now to enjoy the lowest price on the internet! These remarkable bars, from Monarch Precious Metals Relic series, have been hand-crafted to appear as if they're true relics, recently struck from the walls of a long lost tomb! The obverse feature depicts Jackal headed Anubis at work over a fallen pharaoh's remains, highly fitting, as Anubis is the god most closely associated with mummification practise and the soul's journey into the afterlife. This high relief design is accompanied by an atmospheric score of ancient Egyptian hieroglyphs. The reverse imagery, redolent of the complex imagery evident in ancient Egypt’s mighty tombs and temples, features the Jackal headed god Anubis, in both mortal and immortal form. Also on the reverse, an array of hieroglyphs, as well as details of metal content, weight and purity. This artful offering has been given the Monarch antiquing treatment, an antique patina applied, as well as anti-polish and hand shaping so that no two bars are exactly alike. 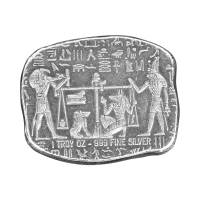 Celebrate the rich and potent symbolism and history of beautiful Egypt and diversify your portfolio with a 1 oz Egyptian Relic Series Anubis Jackal silver bar today!